More than 3 million companies now advertising on Facebook, a figure that suggests that Facebook ads can complement the online marketing strategy of every business. When properly designed and managed, Facebook ads can give your company exposure to a global audience, boost lead generation, and improve SEO ranking in a very cost-effective way. But how exactly can you achieve this? 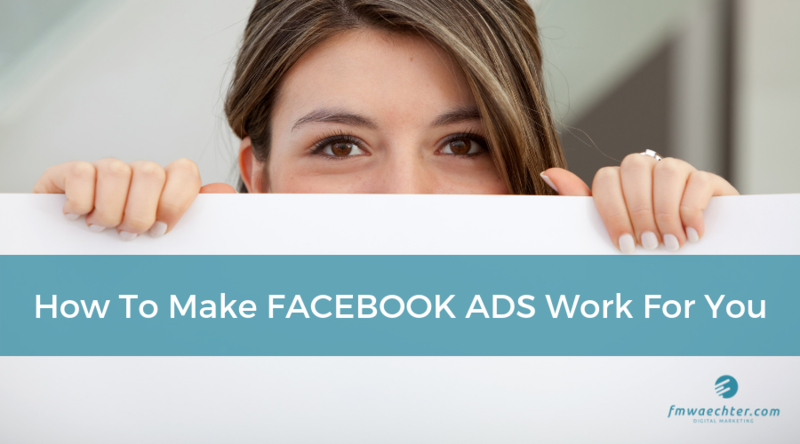 This is your starter guide to making Facebook ads work for you. Facebook ads can be a fantastic opportunity for business owners who want to get their brand message out there. Here are some best practices to ensure you make the most of Facebook’s targeting capabilities and create an ad campaign that works. Don’t skimp on research: Researching your audience is a must before you even start thinking about how the ad will look like. Facebook’s advertising platform is only as precise as your knowledge of your audience! The same applies to the campaign’s goals, which should be research-based and specific. Don’t stick to the same ad format: Facebook ads come in more than ten formats, from full-screen videos to carousel ads, so don’t be afraid to create variations of the same ad and use a format that resonates with your target audience. Don’t overwhelm the audience: Social media users have a preference for visual content and not so much for written text, so use carefully chosen visuals and don’t bombard the audience – think quality vs quantity. Don’t forget the call-to-action: No ad is compelling enough unless it ends with a clear call-to-action. This motivates viewers to take action, whatever that action may be (sign up to a newsletter, grab an offer, make a purchase, app download, etc.). Define the campaign: Use the ad account interface to set the campaign’s goals, start and end dates. Define your audience. Facebook offers a wealth of targeting options within its advertising platform, but you will need to know which demographics make sense for each campaign. Targeting can be very broad from everyone on the social network to people who have liked your page, or custom audiences. You can create a custom audience based on their location, age, gender, interests by keyword, etc. The general rule of thumb is to start small and gradually broaden audience characteristics as you test the ad’s effectiveness. Moreover, targeting small groups is cheaper., so this is how you want to get started. Make use of the advanced budget feature: This not only lets you allocate a budget to the advertising campaign, but also to schedule when you want the ads to appear based on the time when your audience is likely to be online. You can also use this feature to specify whether you prefer to be charged based on the number of impressions (the times an ad is shown) or post engagement. Choose a suitable ad format: You can find a few basic guidelines here. Bear in mind that Facebook has specific requirements regarding the size, file format, word count, etc. of the ad’s photos and copy. Here’s a cheat sheet that you may find useful. Test and re-test: A/B testing is the cornerstone of modern content marketing. The beauty of social media is you can test in real time and make changes to ensure every ad is an opportunity for business growth. Simply put, A/B testing means you create two versions of the same ad (A and B), create two custom audiences, ensure they are shown a different version of the ad, and measure their responses. You then modify the ads accordingly, for example by experimenting with predominant background or image colours, headlines, typography, call to action, etc. Engagement metrics (likes, comments, and shares), although bear in mind that getting more likes doesn’t necessarily mean getting more exposure or conversions since usually, people like a page or an ad and rarely revisit it, unless there was something that was especially attention-grabbing. Rotate the ad: One of the reasons why Facebook ads always don’t work is because the audience can become saturated quickly. This means you will need to have a variety of ads ready and change them every 7 to 14 days to reduce what is known as ad fatigue. To do this, Facebook experts recommend creating ad sets consisting of approximately five ads each. The specific rotation details will be ultimately determined by click-through rates or other metrics like the ones listed above, which can be accessed via the Actions tab in the Ad Manager dashboard. If something doesn’t work, change it, change the frequency, or do both. Mobile first: make sure your ads load quickly in mobile devices and are short and to the point. Facebook – Instagram integration for an even broader reach. This can be done via the Ad Manager dashboard following these steps. Advertising on Facebook is an excellent way of generating exposure, loyalty, and brand awareness. To make Facebook ads work for you, make sure to design a data-driven and visually appealing ad campaign that resonates with your target audience — or even better, get a professional digital marketer plan and manage the campaign for you.